Pitti Uomo is one of the most salivating experiences for internet-trawling fashionistas and the sartorially savvy. I won’t insult the intelligence of readers by explaining, for the 96th time, exactly what it is. You all know what it meant to be, what it actually is and why it gets so much feverish coverage from bloggers and style columnists at this time of year. Personally, I delight in the trove of Pitti peacocks. Life, and people, can be so dull at times and it’s refreshing in a grey January, quite possibly the worst month of the year in London, to have some colourful, bold, occasionally outrageous menswear splashed across the screen. The thing I like about it is that the creativity on display is always within the bounds of what is realistic; not uber-experimental, conceptual, verging-on-art or ludicrously unwearable, unlike some fashion shows where emaciated ‘boys’ parade up and down in priceless bin-bags and Doc Martin boots coated with Swarovski studs. Men, bless us, are fairly traditional at heart and lack the courage to try anything entirely new. And Pitti Uomo is, arguably, as experimental as men like to get. The silhouette is familiar; suits, blazers, slim jeans, ties, loafers, Oxfords, scarves. There’s relevance and where there is relevance there is inspiration. Though not quite as daring as fellow sartorial musketeer Manuel Vanni, who I have previously profiled as a Pitti style icon, Mararo is very much his own man and wears his ensembles with confidence and a happy manner, incorporating that ever-important ingredient of individual style; personal ease and the hint of a grin. You can imagine him looking excitedly through new fashions in an emporium, gesticulating animatedly at a new pair of trousers, trying them in on in a mirror, making his companions laugh whilst doing so by uttering some withering comment. Unlike the Pitti disciples of Nick Wooster – who sport his trendy haircut, short-cut trousers and tight fitting blazers – Mararo dresses like a textbook Italian Romeo. He doesn’t have ‘one look’ or one way of doing things; sometimes you’ll see him in a traditional windowpane suit (with some dazzling accessories, naturally) on other occasions you’ll see him in skinny jeans, loafers and a slim fitting blazer. He therefore has enormous appeal. Men and women consider him to look caddish and unflappably cool, neither in need nor desirous of others’ opinions. He has relevance due to his use of current trends and he has the respect of artistic street-style dressers for his ability to look beyond the suit for inspiration. Well played, Mararo. Whoever you might be. 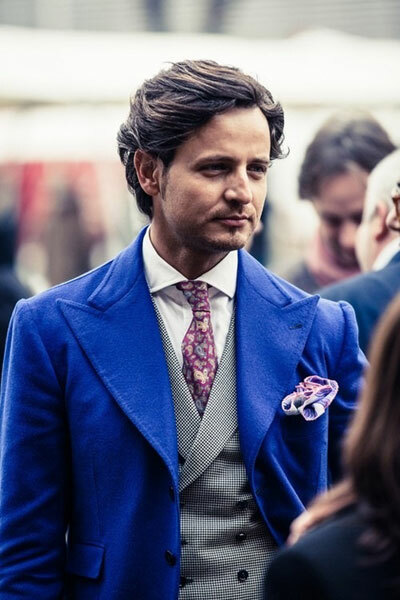 This is a very well balanced summary – Pitti seems to garner a lot of negative commentary (online anyway) but for the most part the people who go there to be seen and photographed retain a sense of elegance even though their outfits are deliberately flamboyant. There are exceptions – notably Lino Ieluzzi (he always manages to look like one of the old teddy boys in the crowd at the London Rock N Roll Show – http://www.youtube.com/watch?v=i_0l1zxNeKg – although this could be the effect he is going for?). my dear friend my name is roberto mararo and the brand mararo is mine so correct your info!!!! I am sorry for the confusion. Please accept my apologies. We will provide a correction. It was difficult to find your real name online!